Gujarat - the western state of India, is turning 50 today. After independence, only one state was formed in Western India-Bombay. Which in 1960-got parted and Maharashtra+Gujarat were born. LAGAAN : [sau saal pehle ki ek aisi kahani....] oops, well, can't resist. The dialogue from 'the' Bachchan always echoes in my mind when I write or speak that word. OK, getting back. The epic, the legend was completely shot at Bhuj, Kutch district. Not a single movie can beat such management, such fantastic visuals which were filmed at a desert ! nothing can & nothing will match the awesomeness of the movie. I'm so proud and lucky to have this movie shot here and also me visiting the location. [more here - 1 2 ] was the lifetime experience. Road, Movie : Talking about beautiful picturisations, recent Abhay Deol movie had great visuals of the white desert. Add beautiful Tanishtaa Chaterjee, the result was awesome. I have been there in salt deserts of Kutch, and believe me, its a sight you can never forget. Here's me in the picture. Magdheera : Ahem, yes, I haven't watched the movie yet, but yes, that too is filmed here. And for that only reason, i m going to watch it soon. Cause visuals are fantastic in these pictures. Hum Dil De Chuke Sanam : This is the movie which was fully based on Gujarati. Shot at Gujarat's locations. Sanjay Bhansali himself being a Gujarati, has brilliantly created beauty of my state on screen. Shot at Bhuj and Gondal, the pair Aisalman, made it more lovely. Manthan & Mirch Masala : Dusky and talented beauty Smita Patil's two fantastic movies. Former told story behind the biggest milk revolution called - Amul. Movie was directed by Shyam Benegal. While Ketan Mehta's Mirch Masala told story of fierce lady Sonbai. Rural Gujarat was captured beautifully in both movies. Guide : yet another legend. Most of the parts were shot in Rajasthan, but the village where Raju comes after jail, was in Gujarat. The drought scenes were actually shot in Limdi, Saurashtra, Gujarat. There was a drought in the state at that time. And when the movie got released, it was advertised as 'Guide prays for rain' and it went on to become a huge success. Mother India : See, all great movies has a link in them-Gujarat. Lagaan, Guide and now this. Yes, this was fully shot at Chikhli, a south Gujarat village. And this is the land where both Nargis and Sunil Dutt fell in love with each other. 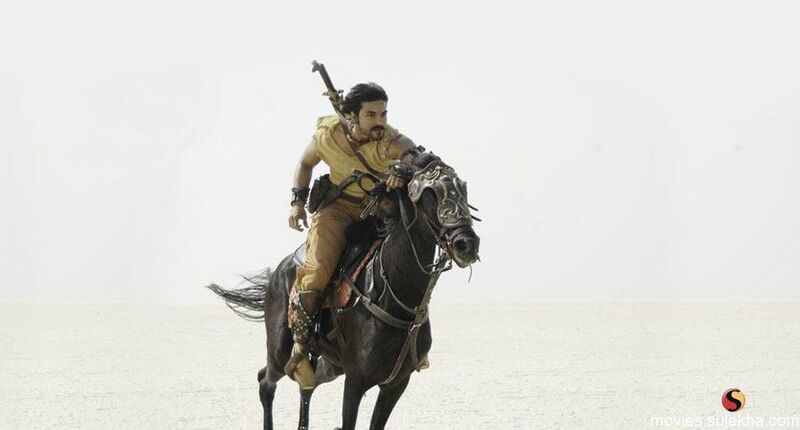 From the very first 30 seconds promo, 'Beera' has become an instant hit. No doubt it has written 'hit' all over the pacey composition mainly lead by drums. Starting with Tribal voices 'Beera Beera' sung by Vijay Prakash, Aslam Mustafa & Keerthi Sargathia - the track is sure shot. Like it always happens-only Mani Ratnam gives such liberty to Rahman, that he brings out his 'experimental' yet 'best' tracks. Next track in sparkling example of veteran Gulzar saab. 'Behne De' is a lyrical feast. Sung by Karthik - he leaves you amazed with his flawless rendition. Backed by Mohammad Irfan's vocals - the dark song is surely a treat. Rahman's favorite is up next with 'Thok de Killi'. With sounds of bagpipes and more chorus singing, the song is uplifting. Drums and bugles sounds make it seem more of a 'war' song. After 'Rasiya' in Mangal Pandey, Rahman is here again with song of same genre. 'Ranjha Ranjha' sung by Rekha Bhardwaj, Anuradha Sriram & Javed Ali has mix sounds of Punjabi folk and remixed beats. Javed Ali sounds so different in this one. With all these earthy sounds, I was keen on something magical like Guru's Aye Hairathein Aashiqui. And then 'Khili re Khili re..' - having sweeeet voice of Reena Bhardwaj - yes the same lady who sang fabulous Yeh Rishta from Meenaxi. Dreamy sound of the track made me fall in love instantly. Tablas are a highlight of this song. Love Love it. Last track 'Kata Kata' sounds like 'Rukmani Rukmani-Part 2'. It has same feel, but this time its not an 'after wedding' song but a before wedding song. Say Bachelor party. The rhyming lyrics of Gulzar saab makes this sound fun. And Ila Arun's Rajasthani lines in this southie song by Sapna Awasthi & Kunal Ganjawala- makes it more interesting. A notable similarity I found in all songs that Gulzar saab has created interesting link of words. Most of them are rhyming, or repeating a single word. See.. Beera Beera, Behne De Behne De, Thok de Killi-baagad Billi, Khili re khili re and Kata Kata. Same thing we recently saw in - Paa. Most of the song had repeated words. So is this going to be the next trend ? 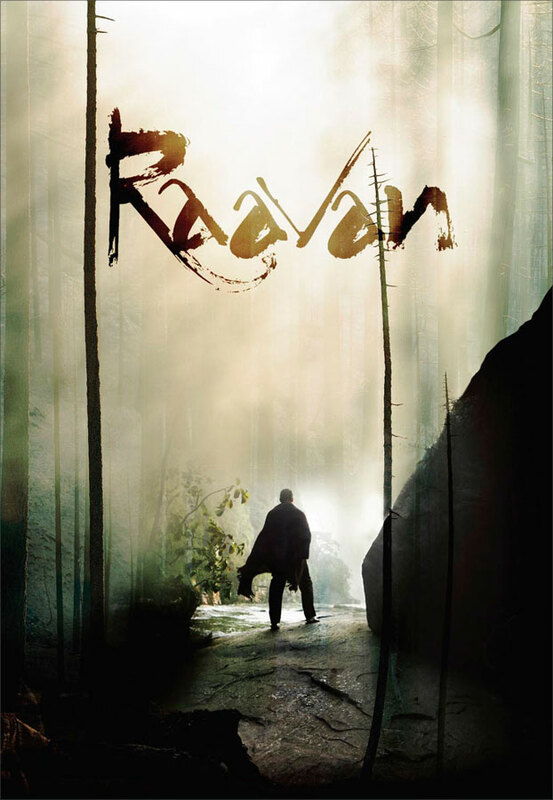 All in all, huge expectations from Rahman's Raavan are fulfilled, but somewhere I am not 'that' satisfied with this. I know that story's demand is for more 'Earthy' sounds, but I love rich compositions, and more songs sung by Rahman himself. :( He doesn't have even a single line in this album. Why ? My Picks : Behne De, Khili Re and Beera Beera. 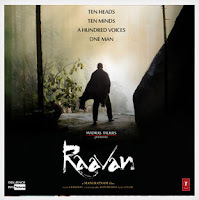 Scintillating composition of Rahman, striking vocal performance of Karthik and mind blowing lyrics of Gulzar saab - mix them all and you get this track from movie Raavan. An outstanding composition created in form of the track 'Behne De' a dark song with unstoppable rendition by Karthik is a gem from the album. No doubt its gonna be played on my playlist for long. Sehra ki pyaas bujha zara..
Nadiyaan mein tapk aur gum ho jaa, beh gaya beh gaya. Jo rah gaya rah gaya. Behne de mujhe behne de..
Jaan teri hai tujh pe vaar doon. ....and it's here. Most anticipated music score of the year- by none other than- God - A R Rahman. So far the first promo itself gave a hint that music of Raavan has earthy touch to it. And by listening to all song previews-its sure that its the same. 'Beera Beera' the very first song itself is so catchy that it can't get out of my mind. Here are the lyrics [by Gulzar saab] of the same. Sung by Vijay Prakash, Mustafa Kutoane and Keerthi Sargathia [Yay !! Gujju !!] the song has 'LARGE CANVAS' feel to it. Well, with Mani Sir, that's assured always. Beera ka abhimaan hai abhimaan hai... Beera. Another annoying thing is Institutes these days. How they emphasize on making their kids versatile [or say claims to make them] in every field, no matter that kid is capable to handle such pressure, capable to cope up studies with extra curricular things. And the institutes that are started after calculating profit margins. I mean, c'mon, is this a factory or something? I don't feel only these 5 star schools can make great next generation. And I praise Director Milind Ukey and Producer Ahmed Khan; for taking these points into account of Paathshala's script. Which is rather flawed, but not in terms of storyline. Paathshala is really an honest effort when you see how it doesn't try to preach anywhere. Has its hearty moments and delights you in many scenes. People compare [obviously] with TZP, but I think this is pretty different thing over here. TZP was all about parental pressure while here that thing is totally missing. Here the main issue is commercialization of education. Performances are quite good. I wish Nana Patekar could have some more scenes than annoying Saurabh Shukla. Nana had a nice climax scene though. Shahid acts well as a sincere English teacher who loves music and kids. Thank God the romantic track is un-developed with Aayesha Takia. [lovely she is, as always]. Kids Swini, Dwij, Ali Haji, Avika Gor and many moe - were totally fun. Still I was dissatisfied with how the movie shaped up. Ahmed Khan had nice story which would be great if Ahmed himself had not written screenplay by himself. Movie doesn't engage viewer completely like [couldn't help] TZP does. When you are making movie about children, you must involve audience with them, otherwise it would fail. Also another thing to note is-scenes about torture [not harsh, but. ..] shall not come one by one, its annoying. No one wants to see sad kids in scenes that comes one by one. Though it had nice intention to show whats happening to today's kids, but not pleasant to see on screen. Still, its the music score by Hanif Sheikh who saved this movie for me. [also, quite nice length of movie helped]. Songs are few, only four, but integrated very well. I kept on thinking how would they put the romantic song in this school movie? but what i saw was cute. Loved the song 'mujhe teri' on screen too. Also 'Khushnuma' and 'Aye Khuda' makes it pleasant to see on screen with all the kids. Fun ! So, final words- you must be confused by this review whether to go for the movie or not?! If you are fan for movies about kids, [I am, always] - you'll like this. If you are regular on my blog, then you must be aware of my love for Horror genre. Even the much criticized Agyaat was fun for me. And recently, loved watching Shaapit. So how could I not enjoy Phoonk 2 ? Yes, yet another horror movie from RGV's factory. This time directed by Milind Gadagkar, Phoonk 2 succeeds to scare you. A sequel to Phoonk, this part is more engaging and well made so that audience get scared. I too did not like earlier movie for its silly Tantra-Mantra and wannabe Exorcist adaptation. But this time, besides so many cliches, I liked how it shapes up on screen. Phoonk 2 starts with the same family going on holiday somewhere near beach. A holiday house and a nearby jungle-An 'I must scare you' setup for a horror movie. And the things turn out going bad as Madhu returns to haunt them again. Setup sounds like Vastushashtra isn't it? Yes, the same setup was there in earlier product of RGV. But this time it is even more scarier. Talking about cliches, I feel it can never be avoided. I mean just think, do you call when a couple starts singing a song - a cliche? Do you call mom-dad opposes their marriage-a cliche? Then why do critics think that shutting doors, scary toys and noise making swings are a cliche?!! Those are mere basic elements for a horror movie. And Phoonk 2 succeeds in using them so effectively that scares. This time, camera movements are pretty less which RGV is famous for. But some new kind of scares are there too. Which makes you jump in your comfortable reclining chair. Screenplay is pretty good that holds your attention most of the time. You know what will happen next, but the way it happens, makes it more fun to watch on screen. My only warning if you wanna watch this movie is - just forget the jokes going on about the movie around. Don't read negative reviews [say any review] before watching the movie. And keep your belief aside that only 'Hollywood can make good horror flick'. [recently I saw The Exorcist trilogy, and I'm still alive !! Yes, boring -I found them]. You will enjoy this. Enjoy being frightened. Oops, and forgot to tell you - be prepared for Phoonk 3 !! Fav Scenes : Climax, Jungle scenes, Toys scenes and Raksha's dream. Happy : When Allu Arjun & Genelia made 'us' Happy ! Yes, you have read that right. 'Us' is the word now. After all, I have got married in recent past, so 'she' is also being a partner in my movie watching spree. As Bommarillu was my first Telugu movie, I insisted that she should watch Happy with me. And by Nicki's review, I knew it will going to be an enjoyable watch. And indeed it was. Happy is an absolutely colorful movie. And with Genelia as lead actress, I can fall for it instantly. No doubt about it. Being first movie of Allu Arjun, I was curious why he has a great fan following. And now I know why. He has great dancing skills, fantastic comic timing and nice acting skills. Though sometimes I felt he was going little bit OTT, [like in climax] but maybe its just because I am new to Southies. Directed by A. Karunakaran, movie is almost flawless. There is hardly any place where movie lacks its grip over screenplay. One by one the twists and turns take place and making movie more interesting as it progresses. What was more surprising to me was the humor. Its absolutely funny throughout. Even serious actor like Manoj Bajpai made me laugh. Equally, romance is so cute in the movie. Loved mushy moments between both Bunny and Madhumita. Only glitch in the movie are its Political moments. I never find politics interesting. Not in movies too. So for me, it was boring part of the movie. But thank God, there were pretty less moments. Song and dance are always a highlight of Southie movies. Besides language barrier, I found all songs interesting. Add fabulous dancing of Allu Arjun in it, pretty enjoyable the songs are. The songs I liked most were, Ossa Ossa - mad mad fun. And I hate You had cute moments innit. While title song Happy, reminded me of my bachelorhood days. :) Wonderful vocals of Shankar Mahadevan made me fall for Nee Kosam. Why do I like South Indian films? When Blogger Dost Nicki, tweeted she's doing blog post about 'why do I like South Indian Films', I instantly decided to do a similar post. Here is her fantastic post which describes power of cinema, which is not bound by barriers of languages. Talking about that barrier, I would say there are so many barriers in India itself. It feels sad, but our country is currently in very delicate phase where everyone is emphasizing on making their own language superior, while completely ignoring others. And that's one reason, why -still being in India- I was away from the movie world of South India. I live in Gujarat-a western state of India. Where it is really tough to get Southies on DVDs. Even in the biggest chain of DVD store, Crossword, they don't have any regional movies other than Gujarati, which is local language here. Thanks to multiplexes, there are some one or two of them, which releases new southies-only the big releases. But only, without subtitles. So, that way, I was untouched by the awesomeness of south Indian movies. Only a few I saw, which were dubbed ,mostly Kamal Hassan's movies, which are always fantastic. Thanks to Blogger, I got to meet Bloggers who are not even Indian, but still love South Indian movies. And by their recommendation, I got to see Bommarillu. The first Telugu movie I saw. And instantly fell in love it. Both Genelia and Siddharth were awesome in the movie. Which made me more curious about their movies. And then, Nicki sent me 4 movies of Genelia !!!! Humbled I am. So far I managed to see Happy. Starring Genelia and superstar Allu Arjun. I absolutely enjoyed that one too. A really entertaining one. So, by watching only two movies, I can't comment on southies. But having watched many dubbed movies, and the famous remakes, I can say Southies are far more entertaining then the average Bollywood products which these days makers are churning out. Mind it, I am a DIE HARD Bollywood fan, but whatever they are making these days, is neither Hollywood nor Bollywood. Its somewhere in between that makes me disappointed. Fresh example is MNIK, where KJo lost his sense in balancing between desi and videsi things. Good old KJo with comedy, drama and naach gaana was more enjoyable then this mediocre stuff. Somewhere I agree with people who says Southie movies sometimes have over the top act and ''oh, i can't believe this'' kind of stuff. But hey, that makes it more enjoyable. After all, its only one little harmless movie, not a true to life documentary. Remember, most of the biggest hits of recent times, are the remakes or the southie formula movies. Sample Om Shanti Om, and you instantly remind Yanna Rascala !! Mind it! . Or the complete entertainment package Wanted. And of course, biggest money churner Ghajini. And oh, my faaaavvv Saathiya. List can go on and on..
What I liked most is how they shape up romance on screen. Its always so cute. See Saathiya. See Hasini in Bommarillu. See Happy. See Kalpana of Ghajini. It always touches your heart instantly. The dance ! And ability to make audience glued to seats. Thing is not that South Indian movies v/s Hindi movies. But thing is, such nice movies are made here in our country, but still, it can't reach to all movie lovers. Bad, bad. Do something about that dear film makers. And oh, don't forget to release movies with subtitles, Please !! This instantly caught my eyes while clicking a link on Twitter. What an idea this is. Having all stars together on a table, having 'The Last Bollywood Supper' !! And the man behind this fabulous piece of art is Shawn Lewis. [@shawnlewis on Twitter]. He has created this canvas in December 2009 for a pvt. firm. [more here]. Click it to go to his site Pictorblanca and the article about this painting. Some fantastic Canvas Art is waiting for you there. As a fan of Bollywood, I loved it from the first sight. Hrithik suits best as Jesus. His current look is the same, which he has got for Guzarish. But only one person I am missing here. Yes, Aamir Khan of course. Dunno, wher he can fit in this ensemble. Any suggestions or comments dear readers?? Oh, and one last thing. This surely is inspirational. Any more such pieces I can see coming up on Blogosphere?? Ayyashi sung by ever dependable KK is extremely Catchy. With the word Ayyashi pronounced in tune as A.Y.A.S.H.I. it easily gets stuck in your head. A Fun track. And next is more fun. Jingle Jingle by Mohit Chauhan starts with nice guitar riff. And surprise punjabi chorus makes it more fun. Lyrics by Anvita Dutt Guptan is really enjoyable. Chaska Chaska reminds me of Aim Lagaa from Striker, for similar sounding words. Krishna sings this foot tapping song about gambling. If you have Pritam as composer, there must be a song by Rahat Fateh Ali Khan. It has became quite regular. And makes me cringe sometime. But for this movie, a quite different track Rahat has got to sing. Rock based Fakeera has fabulous pace and Electric guitar sound. Concluding the album, a James_Bond'ish' title track is another nice one from the lot. Badmaash Company by Benny Dayal must has been used as background score in the movie as it sounds so. All songs make me watch the movie. Cause all and all 'male' fun outing it seems. And with Shahid, Meiyang Chang and Vir Das it must be a riot. [not looking forward to Anushka-at all ] Only disappointment with this album is - not a single song sung by Meiyang Chang :( How can Pritam let go his talent yaar!! Waiting for the movie. Lets see, if Yashraj can come out of his Punjab fields.